Barcode scanning is something different that we see in most of the Android smartphones and iPhone, but there is something by Google that makes things far better, geeky and interesting. It is called the Google Goggles and it is something that recognizes an item, a gadget or any device without the need of the item barcode. The barcode scanner would need the barcode to identify an item. 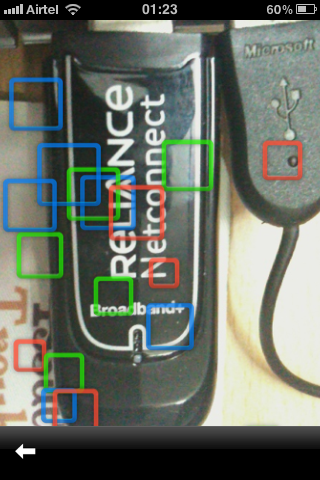 but Google goggles scans the item by its shape, the color and the various dimensions etc. of it and the text on the item to find something similar that might be available in its database. You need the camera open when using the Google Goggles, as it captures the device and then reads the letters on it, the shape etc. and use those pictures to match the others on the web, bringing out some similar results to what you are capturing. 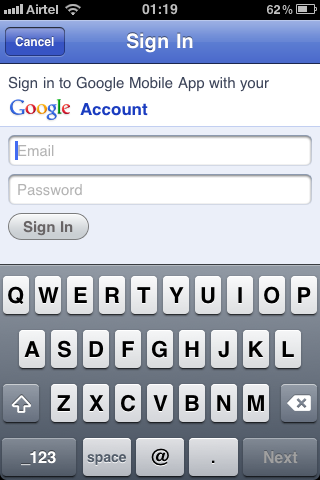 You also need to be logged into your gmail account for the app to be working. 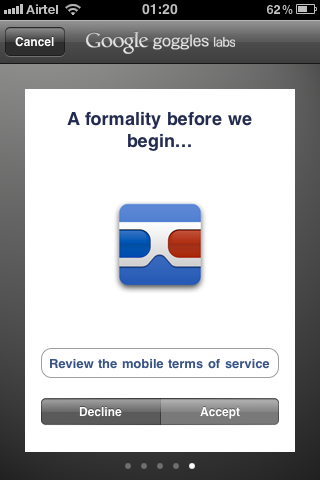 Once you have logged in, the app formality begins with the terms and the app functioning starts. 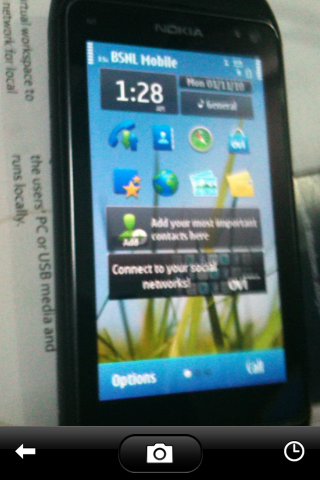 The app page flips once you want to scan an object, and here for a test we tried to scan the Nokia N8 phone first. 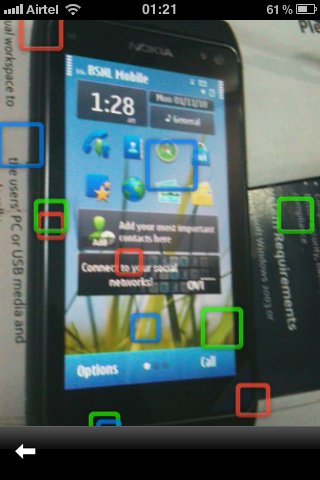 You just need to keep the device clear and pretty near to the camera, well focused. 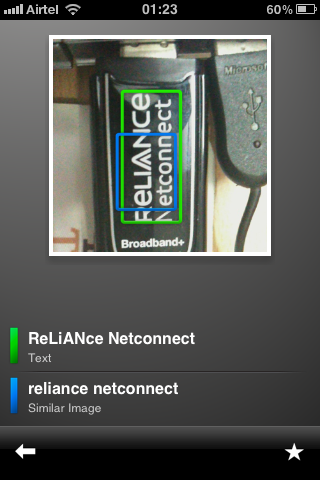 Click on the Camera icon so that a picture is taken and the recognizing starts. Nokia N8 being a pretty easy one to be recognized, we tried with a USB hub of Reliance Netconnect, where once you capture the image it will show the colorful blocks flowing above, while the recognizing and matches are searched. The specialty of this app is that it doesn’t limit itself to searching for the similar images, but it also scans the text on the device and searches for similar results too. 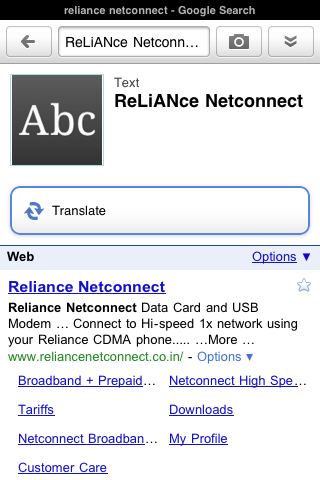 For the Reliance Netconnect, it got results for both the scanned image and even the scanned text. For the text search, it would take you to the search engine page and show you the results that would help you understand what the product could be. 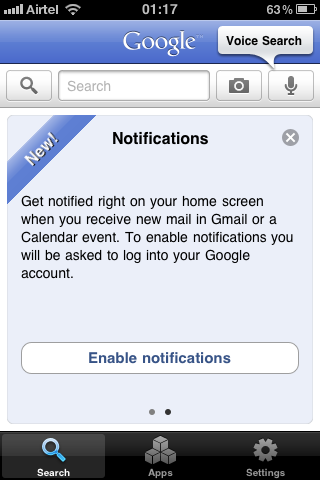 There are quite many settings too which you can do, like you can limit on how Google searches and where the search can be done. 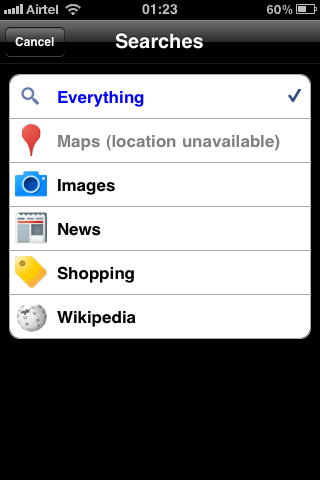 The searching places include the Google Maps, Images, Google web, Google News, Google Shopping, and Wikipedia which all would be almost the entire web. 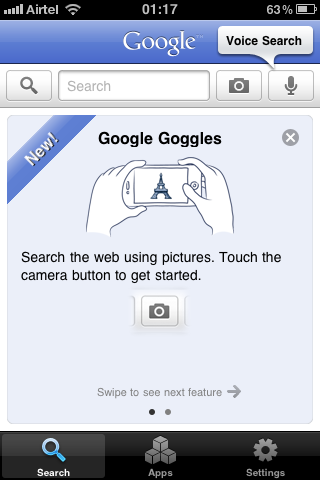 You can check the Google Goggles App and install it from here.